A lesson we could all learn from. Can you imagine, for one moment, what one single day would be like if everyone followed these simple principles? It would be amazing. I find myself not doing random acts of kindness here in China… no one looks at you and smiles, just blank stares at the “foreigner” and that has really changed my attitude… sad, but true. The other day I decided that needed to change. And I’ve been trying to smile more at the starers instead of making a negative comment. It has affected my own inner peace, as well as getting a few smiles back. 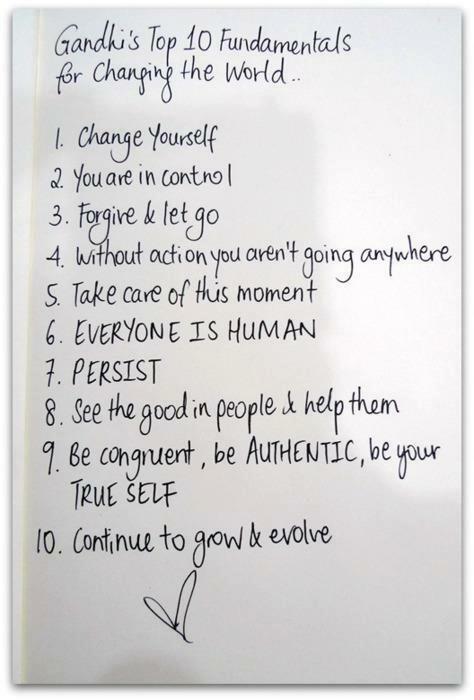 I challenge everyone to try these principles to day and let’s see how fantastic your Wednesday turns out! This entry was posted in China, Dukan Diet, Life, Travel and tagged ghandi, perseverance, positive affirmations, positive attitude, quotes, smile by flamidwyfe. Bookmark the permalink. I find #3 the hardest as well. I can and do forgive. But sometimes find it hard to forget.